Beer Chips packaging is certainly among the most unique and original on the market. 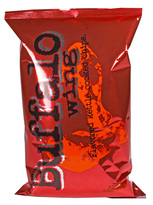 The moody dark red coloring of this bag give the real impression of something hot and tasty inside. The black writing can get a little lost but that is a minor gripe when considering its main use as a beer soaking pub snack. Not the thickest of Kettle Cooked Chips, but the crunch was maintained. There were soft parts here and there as you would expect, but it was a brittle crunch that was loud enough to view them as fresh and well produced. There were however some overly hard Chips. These Kettle Cooked Chips have a nice red tinge to them and many are curled or stuck together as you may expect from Chips of this type. They were a little greasy and a certain amount of residue was left on the fingers afterwards. Buffalo Wing flavor is a bit of a misnomer. It is a kind of barbecue variant. And the taste that was there was not too prominent. The oiliness perhaps invaded and took over a bit too much for our taste test.